The smoke machine and lasers are on, the latest music videos are pumping on the stereo and the cold drinks are on ice. The Hummer lightshow is pumping inside and out with undercar lighting. It’s your School Ball and it’s the most important evening of your life, an evening you simply have to get right. 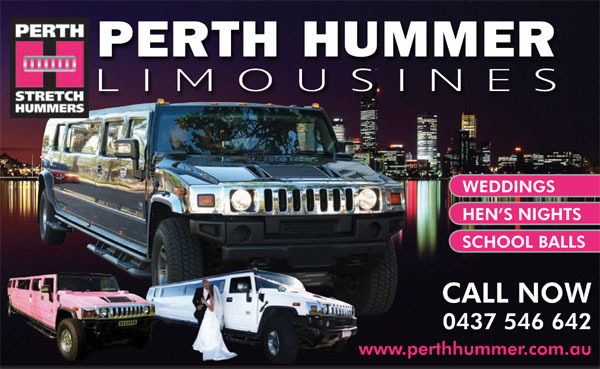 Perth Stretch Hummers offers a fantastic reliable School Ball service with the Hummers polished and ready to transport you to your school ball in Perth or Fremantle. We take a stop on the way such as Kings Park so you can meet up with your friends and take a few photos, we are also happy to do some photos for you. Then sit back with your own music on ipod/iphone or enjoy up to the minute music videos. You know that Stretch Hummer Limos are head turners on the outside but they are also spectacular on the inside. We offer bottled water soft drinks and energy drinks for the return journey. You can request your favourite music video of the moment. Enjoy the triple air-con system and control the lights to suit the mood of the party. So let’s discuss what happens. We have done this before and have a 100% reliability record with never letting one School Ball group down in over 10 years of operating limos. When you are locked in you are locked in and if some kid with a truck-full of money back it up to our door to tempt us away we simply say no and honour the booking we have already taken. We rock up at around 5.45 ready for the 6pm pick up. After mum, dad and siblings have finished taking photos and having a sniffle “my little girl is all grown up” etc etc we get the Stretch Hummer Party Machine on the road. Off to meet up with some friends at Kings Park, but no laughing when they turn up in their limo, After a few shots and a chat a quick tour around town and on to the school ball function. We like to arrive a little after the start time, just to let the uncool kids get inside first. At 11.30 we arrive back at the venue ready for the Midnight Pick Up. A much needed drink, change the mood of the lighting adjust the volume and tempo of the music and slowly cruise back home to get changed for the after party. We wait while you get changed. Its about this time that you get mum to make the driver a cup of coffee. After getting changed its off to the after party. We do not inspect the bags that you bring on board the Hummer as we feel it is an invasion of your privacy. So that’s it. A fantastic School Ball night for everyone in one of the world’s greatest limousines a Stretch Hummer. Now the choice you have to make is whether to hire a Black Hummer in Perth or a Pink Hummer in Perth for your School Ball. And yes we do cover North and South from Yanchep to Dawesville from the Hills to the Ocean. How much is a School Ball Limo? Well that depends Summer is more expensive than winter, weekends are a little dearer than weekdays. To get an exact quote give us a call between 9am and 10pm 7 days a week or use our online contact form.